What history often overlooks is just how poignant those words must have been for Patrick and who might have been the inspiration for them. In 1754 Henry married Sarah Shelton. 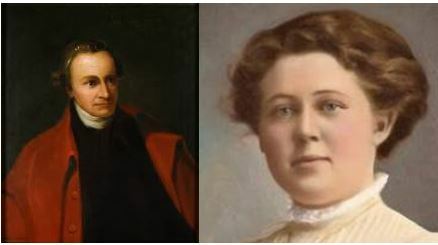 Their marriage was happy until 1771 when their youngest child was born. Immediately after the birth, Sarah’s mental health suddenly declined. Psychologists today suspect she suffered from puerperal psychosis, a severe form of mental illness that sometimes follows childbirth. At the time, however, she was deemed to be demon-possessed. As the psychosis grew in severity, Patrick looked at options for medical help. Unfortunately, the best that modern medicine offered at the time was to commit the unfortunate patient to what amounted to be a prison, where horrendous living conditions and no expectation of any improvement made life for the patients a living hell. Conditions were often intentionally made even more horrific under the theory that fear of the sanitarium would motivate people to remain sane. Mental health being what it was in the 18th century, Sarah’s symptoms were written off as demon possession, and she also faced the stigma of being ostracized by her church and the community. Unwilling to put his wife through this indignity and torment, Patrick opted to care for Sarah at home. He hired trained nurses to be present and care for Sarah, providing her immeasurably better care than otherwise would have been available. As Sarah’s condition continued to deteriorate, it became necessary to confine her to her own area of their home for her own safety. Eventually that became the cellar, which offered the safest environment for her. At times, as her ravings became more extreme, Patrick had no choice but to restrain her with chains to prevent her from hurting herself. As the winds of revolution stirred throughout the colonies, Sarah succumbed to her final illness, leaving her grieving husband to mourn her and contemplate the lessons he learned through the experience. When You Win By Losing … Or Do You Lose By Winning? Think This Caviar Smells Fishy? Wait Until You See the Price!